Dhaka, 28 February : The national mourning is being observed for the second day today as the Bangladesh government announced a three-day national mourning from yesterday to mourn the deaths of those fallen during the border guards' mutiny. The national flag have been kept at half-mast on this occasion. Special prayers were offered at Baitul Mukarram National Mosque this morning for those BDR officers and soldiers killed in the mutiny at the BDR headquarters. Kolkata, 28 February : The West Bengal state government plans to launch a digitized rationing system and allot smart ration cards throughout the state, said food minister Paresh Adhikary. All data about the card holders would be there in the smart cards. Ration shops will be equipped with computers and radio frequency identification technology to read the smart cards. Ration shops will be computerized and card holders can use the system to know the products and price of the food grains stored. Dhaka, 28 February : Speakers at a discussion today called on the government to take proper steps to make vernacular Bangla the sixth official language of the United Nations with a view to introducing the language across the world. They also underscored the need to use Bangla language extensively in all government and private sectors in order to increase its practice at all levels. Bishwa Bangalee Sammelan and Bangabandhu Swadhinata Parishad jointly organised the discussion on 'Establishing Bangla as an official language of UN' at the Bangladesh National Press Club. Urging not to speak mixed version of Bangla and English languages as the trend destroying alarmingly the standards of our language, they also called on the government to enact a law for using Bangla in all sectors to protect the language properly. 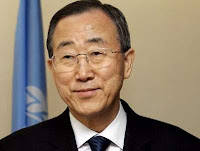 United Nations, 28 February : United Nations Secretary General Ban Ki-moon condemned what he called the “brutal acts of violence,” in the two-day mutiny by members of the Bangladesh Rifles border guards, which have resulted in a mounting death toll. “The Secretary-General calls for calm and the resolution of this situation without further violence,” according to a press statement released by Ban’s spokesperson, which also expressed sympathy for victims and their families. According to media reports, the revolt against military officers left at least 70 people dead, with dozens of bodies found in mass graves, the statement added. 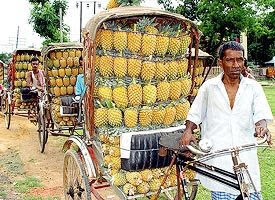 Nandan Nagar (Tripura), 28 February : Pineapple growers in Tripura are a happy lot as the staggering technique has given a boost to the pineapple yield. Earlier, the farmers were gradually moving towards rubber plantation, a more profitable commodity. Pineapple is a highly perishable food crop and even in the cold storage it lasts only for 28 days. Now with the introduction of a new process called ’staggering’ the farmers can harvest the fruit according to their requirement throughout the year. The staggering method has been tested and proven in Tripura’s Horticulture Research Complex in Nagricherra area. 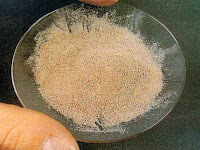 It was first introduced in 25 hectares of farm land in 2005. Now, altogether 200 hectares of land was brought under staggering cultivation for getting raw pineapples in 8-10 months per year. Besides doubling the growers income, the fruit can be harvested almost round the year. There is no glut and the prices are stable over a longer period. To provide growers more market linkage, the North Eastern Regional Agriculture Marketing Corporation (NERAMC) had set up a fruit juice concentration plant, way back in 1988, in Nalkata with an initial capital investment of 30 million rupees. Moulavibazar, 28 February : Fifty three members of BDR's 14th battalion in Srimangal who joined the BDR Week programmes at the headquarters, are missing, the commanding officer said Saturday. Sheikh Mujibur Rahman told reporters that the police took charge of the armoury of the 14th battalion Friday evening. "After the submission of weapons, the armoury was sealed by the police and the deputy commissioner," he added. Kolkata, 27 February : All new construction has been stopped along the coastal area of Mandarmoni in East Midnapore district. On Friday, the green Bench of Chief Justice S S Nijjar and Justice Biswanath Somadder passed the order on a complaint that the cluster of hotels that has come up there has violated the Coastal Regulatory Zone (CRZ) notification of 1991. The notification prohibits any construction within 500 metre from the high tide line of the sea. The CRZ authorities were directed to file an affidavit, explaining whether the hotels (about 20 in number) are located within the coastal zone. The case will be heard again after two weeks. The court was hearing a public interest litigation filed in 2007 by Disha, an NGO. Kolkata, Agartala, Lalmonirhat, Satkhira, 27 February : India's Border Security Force closed their side of the Petropol-Benapol land port, and import-export activities were halted at other ports as the Dhaka Peelkhana mutiny spread rebellion in the ranks of BDR battalions and outposts around the Bangladesh. However, normal trade resumed for two hours as BSF reopened the gate from 5pm till closing at 7pm. Banglabandha's C&F agent Shafiqur Rahman said imports and exports came to a complete stop on Thursday and Friday as traders and transporters stayed away for fear of unfolding events. In Akhaura border of Tripura, officials said BDR personnel prevented port activities. In Burimari, importer-exporter Humayun Sawdagar said BDR closed the check post at Lalmonirhat port. Trucks were piled up on both sides of the landport, Ghojadanga in India and Bhomra in Satkhira. Dhaka, 27 February : The Bangladesh government has named a new director general for the troubled border guards Bangladesh Rifles and said the general amnesty will not be for those who "directly" took part in killings. Abul Kalam Azad, the spokesman for the prime minister, told reporters that an army officer, Brig Gen Moinul Hossain, AWC, PSC would lead the rebuilding efforts of the paramilitary forces. "Those who were directly involved in the killings inside the BDR headquarters will not come under the general amnesty announced by the prime minister," press secretary Azad told. Azad said the prime minister also announced compensation for the victims of the mutiny. He said the government would pay for their children's education. 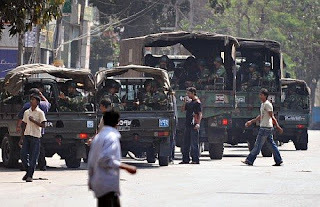 Dhaka, 27 February : Bangladeshi security forces have arrested nearly 200 members of the country's border security force following a two-day mutiny in the capital Dhaka, a security official said on Friday. "We have arrested nearly 200 Bangladesh Rifles (BDR) troops who fled their barracks in civilian dress," a spokesman for the Rapid Action Batallion, the country's elite internal security force, told AFP. 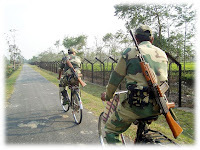 Balurghat, 27 February : BSF jawans on Friday shot dead two Bangladeshis, who were allegedly smuggling cattle taking advantage of the poor patrolling in Bangladesh border in the wake of the mutiny by the forces there, when they tried to run away. BSF sources said the rustlers were taking a herd of 15 cattle at Satimari in South Dinajpur district to Bangladesh early this morning. BSF jawans, who were put on high alert following the Bangladesh Rifles mutiny, asked the duo to stop. However, they did not stop and tried to run away, forcing the jawans to fire at them, officials said. The two died on the spot and their identity was still unknown, officials added. Port Blair, 27 February : Congress President Sonia Gandhi will address a public rally at Netaji Stadium here today. Besides addressing a rally, Sonia is also scheduled to unveil the statue Rajiv Gandhi at Rajiv Gandhi Water Sports Complex. On Saturday, UPA chairperson will visit Car Nicobar and Cambell Bay where she will unveil the statue of former Prime Minister Indira Gandhi at Indira point. Before leaving for Delhi, Sonia will handover the keys of permanent shelter to tsunami-affected persons near airport in Car Nicobar. Dhaka, 27 February : Over 130 army officers taken hostage by Bangladesh Rifles (BDR) soldiers at its Headquarters here remained missing today as the bloody mutiny by border guards ended leaving more than 100 dead, including its chief, officials said. The death toll could not be officially confirmed but security sources said they feared the figure to be over 100 as some 130 army officers remained missing with overnight frantic search for bodies at the mutiny-ravaged BDR headquarters in Pilkhana area here. The survivors confirmed the death of BDR chief Major General Shakil Ahmed at the very onset of the rebellion at a 'Darbar' or meeting of soldiers with senior officers. "Four soldiers jumped forward and killed instantly the DG sir (Ahmed) as he stepped out of the darbar hall as the mutiny started on Wednesday," Lieutenant Colonel Syed Quamruzzaman told reporters this morning. Elite Armed Police Battalion and Dhaka Metropolitan Police units took control of the main Pilkhana headquarters of the paramilitary border guards after the mutineers surrendered their arms and returned to barracks. The police carried out a frantic search along with fire service rescuers overnight recovering seven more bodies. 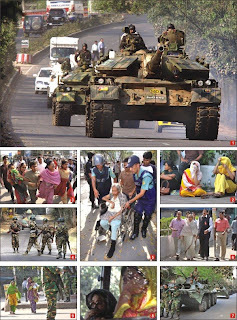 Dhaka, 26 February, 07.00 BDST : Bangladesh Army and Police officers have entered the BDR compound and taken control of the main entrance, apparently ending a 33-hour mutiny. BBC correspondents at the BDR main gate say they saw police vehicles enter the compound, known as Peelkhana, at 6:31pm. Earlier, a top aide to the prime minister said late Thursday afternoon all the rebellious BDR personnel surrendered and that the situation was under control. The prime minister's deputy press secretary Nakib Uddin Ahmed told reporters at 7pm Armed Police Battalion had taken control of the armory at the BDR headquarters. 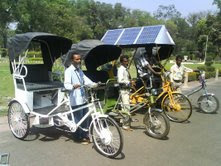 This solar powered Autorickshaw can be described as an efficient pedal powered, motor-assisted three wheeler that is expected to find good utility in downtown urban transportation and freight. “We expect that by 2010 we will come up with an upscale version of the pedicab, which will be installed in large numbers during the ensuing Commonwealth Games.” said CMERI director. Haldia, Kolkata, 26 February : The WB state cabinet has cleared a deep-water port to be built on reclaimed land, the first of its kind in the country, in the Hooghly river estuary. The port, with a depth of 21 metres, will allow big ships carrying crude and other cargo to offload near Haldia and Nayachar, a region where West Bengal’s new petrochemical zone, the PCPIR, is taking shape. Earlier, a deep-sea port was planned in the Bay of Bengal. But now as the port will come up in the Hooghly, it will be called a deep-water port. The New Kolkata International Development, a consortium led by Indonesia’s Salim group that is building the chemical hub in Nayachar, has been chosen the contractor. Land will be reclaimed from the riverbed to set up the port, which will have a tail connecting it to the shoreline of East Midnapore district. Cargo is expected to move in the following sequence. Once a ship offloads, the cargo bound for the Nayachar island will be taken away in barges. If the cargo is for Haldia or elsewhere, the consignment will take the tail link (see graphic) to East Midnapore and move by road or rail further on. The project will cost about Rs 10,000 crore and take three to five years to build. “The state wants to build the port not only for the upcoming PCPIR (the Haldia petrochemical zone) but also for all cargo. Bengal needs a deep-water port because of the declining draught in Kolkata and Haldia,” a source said. Dhaka, 26 February : Bangladesh Prime Minister Sheikh Hasina today urged the BDR mutineers to go back to barracks at this moment after surrendering their arms, otherwise "I'll be bound to take any step in the interest of the country". In her brief BTv address to the nation, she said, "Do not take the law in your own hands. You have to be patience and abide by the chain of commands. I'm requesting you not to find any way of self-conflict. We're trying to resolve your problems with patience. Do not follow any away so that I loss my patience." "I am trying to solve the problems through negotiations not through using force," she said adding, "I'm requesting BDR jawans to stay far from any rumour or any provoking speeches by any groups or individuals." "I'm very socked at the yesterday's incidents," said the premier adding the steps have already been taken for appropriate treatment of the injured. PTI, Shillong, 26 February : The Bangladesh Rifles (BDR) personnel were not seen on regular patrols along the Indo-Bangladesh border on today following their rebellion in Dhaka, a top BSF official said in Shillong. “Our personnel have not observed the routine patrols by BDR nor the personnel since noon,” the official said. He said that the BDR personnel might have been confined to their camps, and added, however, that there was no deployment of Bangladesh Army on the borders. “We have asked our personnel to keep calm and not to be provoked in any situation,” BSF IG (Assam and Meghalaya Fsontier) Prithivi Raj told PTI. 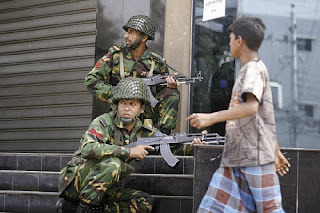 Dhaka, Sylhet, 26 February : Fresh gunfire erupted at a paramilitary camp in the Bangladesh capital on Thursday, police said, as troops took to streets in towns across the country a day after 50 people were killed during a mutiny. 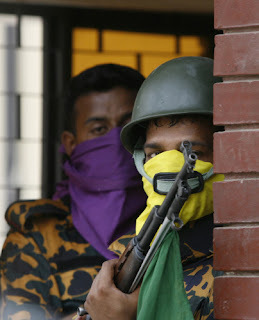 Prime Minister Sheikh Hasina urged calm, but the revolt by some members of the Bangladesh Rifles (BDR) force over a pay dispute spread outside Dhaka after officials earlier said it was being brought under control following an amnesty offer from the government. Mobile phone services were ordered cut by the government in order to stem rumours and misinformation, one cellphone operator said. "Firing started again at the BDR complex in the afternoon although we were expecting the revolt... to end soon," a police officer said. The main duty of the mutinous BDR is guarding the country's borders, but often they back up the army and police in meeting other defence and security requirements. Earlier officials said nearly 50 people died in Wednesday fighting at the BDR Dhaka headquarters, a blow to hopes Hasina's government, which took office only last month. A witness in Sylhet in the northeast said BDR troops were "coming on the street holding up guns and shooting". Pune, 26 February : Rowers from Andaman and Nicobar Islands, comprising eight men and women each, tested the waters at the Khadakwasla lake today, where the Indian National Rowing Championship is scheduled to start on Friday. The team would, on a given day, look like any other team, full of confidence. Dig deeper and you will find that it comes in many colours and shades. Hit by tsunami: The deadly tsunami in 2004 destroyed all their boats and other equipment and getting new ones proved a task unfulfilled. “The girls and boys, who are a part of the Sports Authority of India (SAI) coaching scheme, are still waiting for new boats,” said D Rama Rao, coach and manager of the team. Natural rowers: “This time, most of the rowers in the women’s team are school and college students,” Rao said. “SAI took them under their wing to hone their skills.” And he insists it’s not difficult to carve out a professional rower out of them because people in his state are natural rowers. “The Nicobaris use a boat called Ohodi for traveling between the islands daily. It is very similar to these scull boats that are used in competitive rowing,” Rao adds. The other advantage rowers from island have, says Rao, is their experience of rowing in sea. 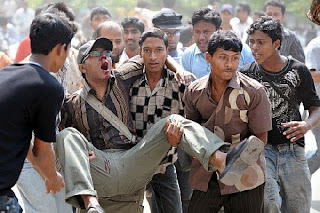 Dhaka, 26 February : Nearly 50 people were killed when Bangladeshi paramilitary troops mutinied over a pay dispute at their headquarters in Dhaka, a government minister said on Thursday. The mutinous soldiers began laying down their arms after accepting an offer of amnesty from the government, but the uprising in the capital on Wednesday underscored the challenges facing new Prime Minister Sheikh Hasina. "Nearly 50 people have been killed in sporadic fighting in the headquarters of the Bangladesh Rifles (BDR)," Md. Quamrul Islam, Bangladesh state minister for law and parliamentary affairs, told reporters. Quamrul said all weapons would likely be surrendered in the coming hours. Dhaka, 25 February : A nine hour high drama ended late Wednesday afternoon after Bangladesh prime minister Sheikh Hasina declared general pardon for revolting BDR men and pledged to meet their demands in phases, a state minister said. The BDR mutineers had agreed to surrender their arms after a meeting with the prime minister at her official residence, state minister for local government Jahangir Kabir Nanak told reporters. At least 14 BDR personnel in uniform, accompanied by government negotiators, entering the state guesthouse Jamuna at around 3:40pm (BDST), as gunshots continued inside the BDR headquarters. At least one civilian was confirmed dead and 7 were wounded as heavy gunfire erupted in and around Bangladesh Rifles Headquarters in the morning. A number of top BDR officers were killed inside the compound, sources said. The BDR personnel sent out a letter to the media, claiming their personnel have been long-oppressed by army officers. The Bangladesh prime minister also met with the chiefs of army, navy and air force shortly after 2pm over the mutiny. Agartala, 25 February : A total 17 people have died of meningitis in Tripura's Dhalai district since 22 January, government said on Wednesday. Replying to a question in the Assembly, Health and Family Welfare Minister Tapan Chakraborty said the 17 deaths were reported from different villages in Longterai valley subdivision from 22 January to 24 February this year and the government has taken all precautionary measures to check it. He said the state government wanted to undertake mass immunisation programme in the subdivision but the National Institute of Communicable Diseases has turned the proposal. Tripura opposition leader Ratan Lal Nath, however, claimed that at least 57 tribal villagers have died of meningitis in Manu and Chawmanu blocks and criticised the health minister for not being able to control the disease. Purulia, 25 February : A Maoist team ambushed and shot four RPF jawans on an express train at Purulia's Barabhum station on Wednesday afternoon. Two of the jawans died on the way to hospital in Bokaro. The guerrillas looted their weapons and cleared out of the station within minutes, leaving Maoist posters scattered on the ground. 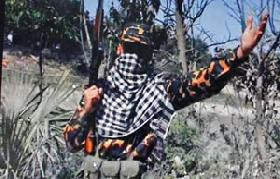 Bystanders said that the attack was carried out by a team of 10-15 Maoists. They had broken up into smaller groups and had taken up position at least half an hour before the Tatanagar-Dhanbad Subarnarekha Express arrived at the station around 2.30 pm. Dhaka, 25 February : The authorities of Dhaka University have postponed all examinations scheduled for Thursday due to an unavoidable circumstance, a DU press release said. Fresh schedule for the postponed examinations will be announced later. Dhaka, 25 February : The Amar Ekushey book fair witnessed a very poor turnout on Wednesday as very few book lovers, panicked by the BDR rebellion at their Dhaka city headquarters, visited the fair. A good number of stalls remained closed during the fair hours and two of the three entrances of the Bangla Academy premises did not open. 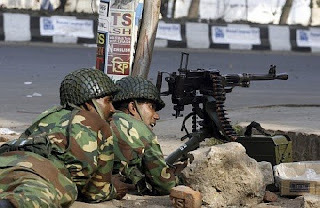 Kolkata, 25 February : All border districts in West Bengal have been put on alert following the mutiny by Bangladesh Rifles (BDR) troopers in the neighbouring country's capital city of Dhaka. "The district magistrates and superintendents of police in the border districts have been told to be alert. They have been asked to take all steps," WB state home secretary Ardhendu Sen told reporters. Sources said the Border Security Force has also been alerted by the union home ministry. 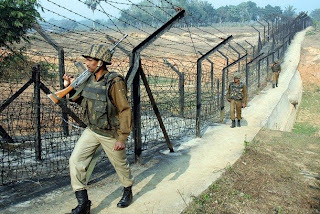 India shares a 4,095 km-long border with Bangladesh, including the longest 2,216 km in West Bengal, part of which is porous, riverine and unfenced and prone to frequent infiltration and skirmishes. Dhaka, 25 February : Heavy casualties are feared as intense gunfire rocked the Bangladesh Rifles (BDR) headquarters in Dhaka’s Pilkhana area on Wednesday after a mutiny broke out in the border force with renegade soldiers holding their top officers hostage over an apparent pay dispute. Though the army and the rapid action force of police had encircled the BDR headquarters located in the heart of Dhaka, there was no word on what was happening inside the complex which was a scene of heavy firing for hours in the morning. However, at least one civilian was killed and scores injured in the gunfire outside BDR headquarters after the rebel soldiers stormed out and briefly seized a nearby shopping mall. Speculation was rife that several senior BDR officials, including its Director General Maj Gen Shakil Ahmed, were among those taken hostage by the mutinying soldiers. According to local ATN Bangla television channel, the mutinying soldiers threatened they would destroy everything in and around Pilkhana if attacked by the army. "We have taken all the officers hostage," an unnamed BDR soldier told the channel. He did not specify the number of captives or whether there had been any casualties. He said they would not free the captives unless the government declares general amnesty for all of them, meets the rebels' demands and withdraws army from outside the complex. A statement issued by the Army Inter-Services Public Relations told the BDR soldiers to lay down their weapons in "greater interest of the country". Tripura Assembly adjourned twice followed by walk out of opposition Agartala, 25 February : Tripura Assembly today witnessed two subsequent adjournments at the beginning of business, followed by termination of Question Hour, and finally the opposition walked out from the House, demanding implementation of sixth pay commission recommendations and sending of an all-party delegation to Meningitis affected areas. Speaker Ramendra Chandra Nath adjourned the House within five minutes after beginning the session when opposition Congress demanded pay hike for state government employees at par with the Central government employees. When the House reassembled after 15 minutes, the opposition MLAs stormed into the well with the same demand but the speaker disallowed any discussion on pay hike issue during Question Hour and finally the House was adjourned till 1200 hours. Dhaka, 24 February : A two-day counter-terrorism conference began in the city Tuesday, on concerns that South Asia has become the "centre of gravity for terrorism". "It is very unfortunate that there is such low-level of cooperation among South Asian countries in this regard," Bangladesh foreign minister Dipu Moni told the opening session of the international meeting. Experts from six South Asian countries, the USA, Canada, Germany, Norway, Spain, Australia, and Singapore were attending the event in the backdrop of Bangladesh's campaign for a regional anti-terrorism task force. Dipu Moni affirmed the present government's plan to work closely with partners in the region and beyond to counter terrorism and militancy. She also stressed that it was not productive to point the finger at any particular religion for harbouring terrorism. 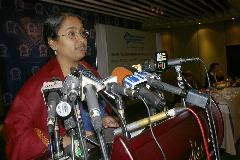 Speaking to newsmen later, Dipu Moni said there was no framework or timeline yet for the planned regional task force. "It is still at an 'idea' stage." The conference on 'Counter Terrorism Strategy for South Asia' was being hosted by Bangladesh Institute of Peace and Strategic Studies, at the Radisson Water Garden Hotel. Siliguri, 24 February : The Gorkha Janmukti Morcha, fighting for separate statehood, has challenged the West Bengal government to go ahead with its threat of cutting power supply to Darjeeling hills.While inaugurating a rural power project at Rupamdighi, 20 km from here, WB power minister Mrinal Banerjee had on Monday threatened to cut off power supply if the non-payment of electricity bills continued. 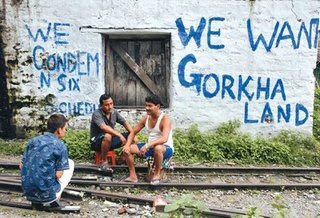 GJM general secretary Roshan Giri said, "Banerjee is free to stop power supply to the hills if he has the guts. We know what to do thereafter. "The minister told Bengal News, that residents of the Darjeeling hills had stopped payment of electricity bills after having been asked to do so by the GJM and that the arrears had run into a few crores of rupees. The government was so long restrained from snapping the power supply on humanitarian ground, "but no more". Kolkata, 23 February : Batting for the politics of collaboration, Nobel laureate Amartya Sen exhorted political parties in West Bengal that it was time to come together and do some stocktaking. Speaking on "Economics, Politics and our lives", organised by Pratichi Trust on Monday at Rabindra Sadan, Sen said "All political parties should remember their past. Things have happened which should not have happened. There is a need for collaboration. Political parties have to realise whether the use of means like strikes are justified." Later in an exclusive interview with Bengal News Proffessor Sen focussing on West Bengal, said the future of the state without industrialisation was not bright. "This state had a very bad reputation associated with activism. That has returned now. West Bengal's prosperity based on industrialisation came from textile industries set up on fertile land besides the Hooghly." He did not spare the Left parties either, for advocating bandhs and strikes at the drop of a hat. "Bandhs have been called by both sides. It is peculiar when a ruling party calls a bandh. Being in power, it ought to be able to do without bandhs. In such a scenario, industrial development is increasingly impossible. The rapid decline of West Bengal's industries is not surprising. The state has gone off the way due to the bandhs". He was also critical of militant trade unionism calling the movements "self-defeating". Focussing on Bangladesh, he said "the recent power changes in Bangladesh are most welcomed. It's really a new beginning in South East Asia. I'm originally a Dhaka boy. So positively anything happend in Bangladesh is a matter of joy to me. The concept like your www.bengalnewz.com is far beyond the man-made boundary...he explained. Commenting on global recession, Sen said lax regulations had led to the present situation. "The financial sector in the US was a regulated one. Faith in the self-adjusting nature of the market economy has seen a gradual erosion of that control. There is a lack of accountability in the financial sector. Though the need for regulation has grown, actually it has shrunk". He added that the economies of India and China have not gone bust but will slow down further in the next two months. Satkhira, 23 February : A joint river demarcation survey along international water frontier has began in Satkhira. A total of seven experts from Bangladesh and India are carrying out the survey. On the first day, the survey works have started from the main pillar number-1 in Padmasakra area under sadar upazila of the district. The survey will continue along two bordering rivers Ichhamati and Kalindi. Sources said during the 1947 partition, the mid-streams of these rivers were taken as the demarcation line between the two countries. Due to river erosion over the years, As India Bangladesh also lost several villages along the rivers and chars were emerged in the other side, and mid-streams of the two rivers are no more remain as demarcation line. Dhaka, 23 February : Bangladesh National professor Kabir Chowdhury has been named new Bangla Academy president, the academy's director general said on Monday. He is yet to join, said Syed Mohammad Sahed. The Bangladesh cultural affairs ministry appointed Chowdhury to replace Professor Harun-Or-Rashid, whose tenure ended on 3 February. 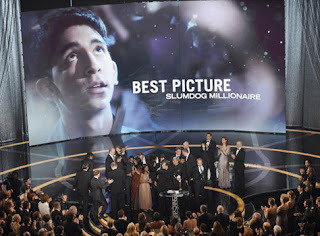 Reuters, Los Angeles, 23 February : Indian film 'Slumdog Millionaire' sweeps eight Oscars at the 81 st Academy Awards including Best Adapted Screenplay, Cinematography, Sound Slumdog Millionaire shines at the 81st Academy Awards. Mixing, Film Editing, Original Score, Original Song, Direction and Motion Picture. Indian music maestro A R Rahman brings home two awards with his Jai Ho... composition. Rajshahi, 22 February : Seven more people face 1971 'war crimes' charges in Rajshahi in a case filed with a magistrate's court Sunday. Sufiya Begum, daughter of Tasir Uddin of Senduri village in Mohanpur, filed the case with Rajshahi Chief Judicial Magistrate's Court. Magistrate Mohammad Alamgir directed Mohanpur police to take legal steps after investigation. According to the case details, the accused were involved in the deaths of the plaintiff's brothers Mofij Uddin and Kafil Uddin, killed by Pakistani occupation forces in 1971. "After they were killed, the bodies were not even returned," said Sufiya. She also claimed the case was known to all the villagers. Police on 12 February arrested another two Rajshahi men in a case filed on 22 June, 2008, on charges of killing 19 people of Mugrail in Mohanpur during the liberation war. Dhaka, 22 February : Bangladesh President Zillur Rahman today emphasised the importance of regular contacts and exchange of visits by parliamentarians of Bangladesh and India to further bolster bilateral ties between the two countries. He also said Dhaka and Delhi could work together to further strengthening parliamentary democracy in the region. 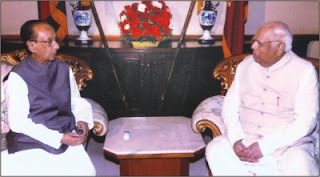 "There are scopes for working together to make our parliament main centre of decision-making and accountability," he said while talking to Indian Lok Sabha Speaker Somnath Chatterjee when he called on the Bangladesh president at Bangabhaban. 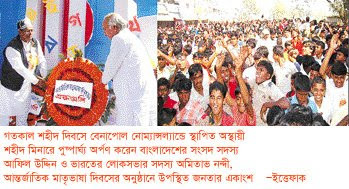 President Zillur welcomed Somnath Chatterjee and thanked him for visiting Bangladesh. "We believe people-to-people contact is essential to deepen relations between the two countries," he said. Jhenidah, 22 February : Jhenidah Members of the law enforcing agencies today destroyed a poppy field at Nepa village under Moheshpur upazila in the district. On a tip-off, Police, Rab, BDR and the officials of drug and narcotics control department raided the area and destroyed the 'opium poppy' grown on five bighas in the village, 62 kilometre away from the district town. Police said, a citizen of Ayet village, cultivated the poppy. Dhaka, 22 February : The MPs must not speak in parliament the way they do at political rallies and need to educate themselves on national issues, Indian speaker Somnath Chatterjee has aid. "Talking in parliament and addressing rallies in the public places are quite different," Somnath Chatterjee said at the launch of a four-day orientation programme of newly-elected MPs at Hotel Sonargaon Sunday. Every institution, he said, had its own rules, and parliament had rules of procedure which the MPs must follow. Chatterjee, who came yesterday, Dhaka to train the newly-elected MPs of Bangladesh, said frequent commotion in the House was not good for any country. On the Indian experience, Chatterjee said, "We have formed parliamentary forums on women, children, climate change and water management. There are many public-importance issue which people don't know. The USAID and Washington-based National Democratic Institute co-organised the first ever orientation workshop for the MPs. Among the 296 MPs of the ninth Bangladesh parliament, 162 MPs have been elected for the first time, who know little about how parliament works. Dum Dum, 22 February : After his tryst with the City of Joy in 2004 for the shooting of 'Yuva', director Mani Ratnam is back for his ambitious project 'Ravana', starring by Bollywoood's star couple Abhishek Bachchan and Aishwarya Rai. Though the film has characters named Ram, Sita and Ravana it has no connection with the Ramayana, Art Director Samir Chanda said. "It is a film set in contemporary times and it is fascinating the way Mani treats his concept," said Chanda who was instrumental in zeroing in Agarpara as a locale for the new film along with international fashion designer Sabyasachi Mukherjee. Simultaneous Hindi and Tamil shots were taken in the first three days of shooting at the sprawling Saheb Kuthi villa besides the river Hooghly at Agarpara in the northern outskirts. This celluloid venture began at Agarpara from 17 February. It was expected to continue till the first week of March, a unit member said. Kolkata, 22 February : West Bengal Chief Minister Buddhadeb Bhattacharjee was on Sunday shown black flags by women activists of Trinamool Congress when he was arriving at Salt Lake stadium here to lay the foundation stone of East-West Metro Railway. Members of the women's wing of Bidhannagar Block TMC waved black flags as they chanted "Go Back Buddhadeb Bhattacharjee" when his convoy was entering the stadium. The activists alleged that the foundation stone laying programme was a ploy to woo voters ahead of parliamentary election. Indian External Affairs Minister Pranab Mukherjee and Swadesh Chakraborty, Howrah MP, are attending the programme. East-West Metro will run below the Hooghly river to connect Kolkata's IT hub of Salt Lake with Howrah Maidan. Rangamati, 21 February : The Bangladesh state minister of for the Chittagong Hill Tracts affairs, Dipankar Talukdar, inaugurated a week-long book fair in the Rangamati Old Stadium as part of the observance of International Mother Language Day, which is today. Chittagong Development Board vice-chairman SM Ashraful Islam and the Rangamati municipal mayor attended the programme as guests. The deputy commissioner, Nurul Amin, presided over the programme. Also an eight-day book fair begins in Rajshahi city today to mark International Mother Language Day. Benapol, Dhaka, 21 February : The West Bengal government presented Bangladesh prime minister Sheikh Hasina 100000 pieces of rasagolla, a popular Bengali syrupy dessert, Saturday, the International Mother Language Day. West Bengal's transport minister, handed one of the sweets packets to Jessore-1 MP Sheikh Afil Uddin at a ceremony at No-Man's Land near Benapol Land Port in Jessore around 11am. The sweets have been given as a gesture of goodwill on the victory of Hasina-led Awami League in the general elections and in appreciation of the development of democracy in Bangladesh. Bengali-speaking people from either side of the border joined a fair, seen as reunion of sorts, where the ceremony took place. A daylong cultural function followed. Agartala, 21 February : The Tripura government Saturday announced 30-35 percent hike in salaries of its 138,300 employees, with retrospective effect from last month. 'After the sixth central pay commission, Tripura is the first among the eight northeastern states that announced new salaries and allowances for its employees, making 30 to 35 percent salary hike with effect from January,' state Finance Minister Badal Chowdhury told reporters after a cabinet meeting. Bengal Newz team Salluate Salam, Barkat, Rafiq, Shafiur, Jabbar and a few other brave Bengal's sons of the soil sacrificed their lives on this day to establish Bangla as one of the state languages. Dhaka, Kolkata, 21 February : Thousands of people thronged the Dhaka Shaheed Minars, Kolkata Bangla Academy, Behala, Thakurpukur, Siliguri, Durgapur, Agartala, Silchar....all across the Bengal area to pay respect to the Language Movement martyrs. Who laid down their lives back on 21 February, 1952 for recognition of Bengali as one of the state languages of the undivided Pakistan. The Central Shaheed Minar of Dhaka, Kolkata Carzon Park, Rabindra Sadan, Bangla Academy and its adjacent areas have had a facelift on the occasion, and roads and medians have been festooned with Bangla alphabets and the Shaheed Minar's Memento. In Bangladesh the day is a public holiday. The national flag will be hoisted at half-mast atop all government, autonomous and private buildings. Bangladesh President Zillur Rahman and Prime Minister Sheikh Hasina placed wreaths at the Central Shaheed Minar one minute past zero hours. Stringent security measures were taken in and around the Dhaka Central Shaheed Minar following yesterday's militant attack in Gazipur and threats of attacks on Ekushey programmes by outlawed militant outfit Jama'atul Mujahideen Bangladesh. UNESCO proclaimed Feb. 21 the International Mother Language Day on 17 November, 1999 to honour the sacrifices of language martyrs Salam, Barkat, Rafiq, Jabbar, Shafiur and the ones whose names could not be known on that historic day in 1952. Since the UNESCO proclamation, 188 countries across the globe observe the day to promote linguistic diversity, multilingual education, and to raise awareness about cultural traditions based on understanding, tolerance and dialogue. Midnapore, 21 February : Farmers of Dantan in West Midnapore were livid after a herd of elephants entered the Tararoi gram panchayat area and ransacked a paddy field on Saturday morning. Also, forest officials were allegedly late in reaching the area despite being informed early in the morning. "A herd of 70 elephants with eight calves entered near Singhda in Dantan and rampaged a huge paddy field," said a villager. "The herd damaged more than a few hundred bighas of boro paddy field at Singhda, Tarorai and Kusturia villages. "The herd, of 70 elephants and eight calves, damaged more than hundred bighas of Boro paddy field. Forest officials delayed in reaching the area, fearing farmers would demand compensation," said Shankar Pal, a farmer of Kusturia. "I was far away from the villages. So, it took time to get an office car and collect the office staff. We are trying to chase the herd to Nayagram or Jhargram," said M K Mondal, divisional forest officer of Kharagpur. Gazipur, 20 February : At least 12 people were wounded Friday when a JMB militant in handcuffs exploded a grenade at the office of the superintendent of police for Gazipur Sadar. "Some 100 journalists and police were gathered at the SP's conference room, As the press briefing concluded, and people were leaving, the photographers were taking photos of the JMB arrestees and the seized explosives, One of the militants, Mamunur Rashid, pounced on one of the grenades that were on display for the press" assistant SP (Tongi circle) Jamil Hasan told Bengal News. At least 12 people were wounded in the explosion, including officer in charge of Joydevpur Police Station Abdur Rashid and several other policemen and journalists. Howrah, 20 February : The East-West Metro will run till Howrah Maidan. The Centre's committee of empowered ministers gave its nod to the extension on Thursday. The meeting in New Delhi was attended by Indian finance minister Pranab Mukherjee and home minister P Chidambaram while WB transport minister represented the state government. The decision to float tenders for the elevated part of the project was also passed. UNI, Agartala, 20 February : Tripura Governor Dinesh Nandan Sahaya today visited air-maintained border outposts at Trulpaibari and Sher in an Indian Air Force Helicopter, accompanied by S K Mishra, Inspector General, BSF Tripura frontier. An official release here today said Sahaya interacted with the villagers at Trulpaibari and discussed various civic problems faced by them. The Governor also assured them that necessary steps would be taken for the improvement of their standard of living. He also praised the BSF jawans who had been performing their duties well, in difficult locations, while protecting the international borders and also extending all possible help to the local people. PTI, New Delhi, 20 February : With economic slowdown leading to huge layoffs in certain sectors, the Indian government on Friday said jobs must be retained even if it meant cut in compensation. "Jobs must be protected even if it means some reduction in compensation at various levels," finance minister Pranab Mukherjee said at International Labour Conference here. He said the government is making all out efforts to ensure flow of credit to boost trade and investment, consumption and to stimulate additional demand through public and private expenditure. Mukherjee later told reporters that in the interim Budget he had talked of encouraging investments in infrastructure and in housing and real estate, adding that the government is providing adequate resources for programmes like NREGA and Bharat Nirman. Kolkata, 20 February : You've seen them on television reporting on crisis situations and read their critical columns. On Sunday, you can see and hear them discuss a crisis that has hit home. For, some of the biggest names in the Indian media world will assemble in Kolkata to discuss the media's role in times of crisis. The seminar on crisis reporting, organised by NSHM Institute of Media & Communication (NIMC), Kolkata, in association with The Times Of India, has become relevant in the wake of scrutiny and criticism that a section of the media came under following reportage of the 26/11 crisis. The day-long discussions will be held at Vidya Mandir in Kolkata on Sunday. Veteran media personalities scheduled to participate in the discussion include Peter Mukherjee, M J Akbar, Tarun Tejpal, Aniruddha Bahal, Sudhir Mishra, Pradeep Gooptu, Pradeep Mallik, Chandradeep Mitra and Dr Sandeep Chatterjee. The seminar will be moderated by Paranjoy Guha Thakurta. Renowned journalist Subir Bhowmik now is in Agartala, so perhaps he could not participate in this seminer. Dhaka, 20 February : A delegation led by Deputy Minister for Economic Development of Russian Federation Anna Popova arrived in Dhaka yesterday on a four-day visit to Bangladesh to learn about operations and the legal structure of Grameen Bank and to replicate the structure in Russia. Nobel laureate Prof Muhammad Yunus, MD of Grameen Bank, received the minister and her 9member delegation at Zia International Airport. Gennady P Trotsenko, Russian ambassador to Bangladesh, was also present to greet the minister. The minister and her delegation visited the branches of Grameen Bank and have discussions with the borrowers today. Anna Popova also meets the Bangladesh finance minister, other government officials and members of the civil society. Kolkata, 20 February : The jinxed tiger census at West Bengal's Sunderbans will finally take off this month. It will use a new method and employ technology that has never been used for taking a big cat count anywhere else in the country. Officials of the Wildlife Institute of India (WII) confirmed that the decks have been cleared and a blueprint put in place for the job that will also include a study of tiger behaviour in the mangrove forest. The last census was conducted in the Sunderbans in 2001 that put the tiger population at 265. It was later disputed by a software analysis which led to the stalling of the 2006 census. This time, the WII will use an imported radio collar. Being purchased at a cost of Rs 3.5 lakh each, the authorities plan to buy 10 of them from Canada. These are going to be "tougher and more suitable" for Sunderbans conditions unlike the one used in December 2007 that had malfunctioned. The new collars have been successfully used on elephants, mountain lions and polar bears abroad. 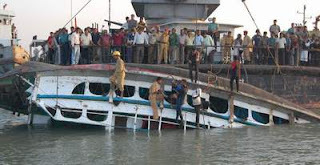 Barisal, 20 February : At least 31 bodies were recovered, and over 20 passengers were still missing feared dead, more than twelve hours after a launch capsized in the Kirtankhola river in Barisal Thursday. The "ML Happy", heading towards Patarhat from Barisal, capsized at around 6:30am yesterday after a sand-laden cargo vessel hit it at Beltala, some three kilometres out from the district down. Some 50 passengers were initially reported missing based on estimates by BIWTA officials and police. Barisal police assistant commissioner Hayatul Islam told BSS from the site that 28 bodies had been recovered. 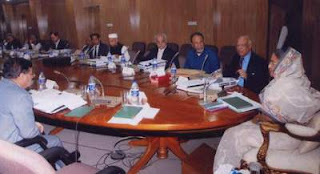 Dhaka, 19 February : The Bangladesh cabinet today approved the Anti-Terrorism Ordinance (ATO), 2008 and the Representation of People (amendment) Ordinance. As per the anti-terrorism ordinance, the government can form special tribunals to bring any offenders to justice. 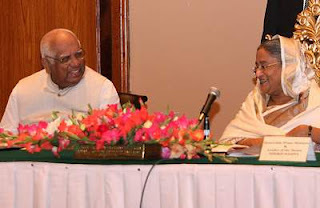 Chaired by Bangladesh Prime Minister Sheikh Hasina, the cabinet in a special meeting approved five other ordinances. The cabinet directed the Election Commission to give its opinion on the necessity of the option for 'no' vote on ballot. Jalpaiguri, 19 February : Two bison died after the forest department tranquillized them. The incident occurred in Falakata on Wednesday. The bison, a vulnerable species, had strayed from the Jaldapara forest and entered the Guwabarnagar gram panchayat area around 7 am on Wednesday. Soon, they were spotted by villagers. Seeing the mob, the bison went on the rampage, injuring four villagers. They then entered Malsaga village. Here, they injured three people. Forest officials tranquillized them. The animals were loaded on to a trailer, to be released in Jaldapara. But, on reaching the destination, both animals were found dead. "They died of cardiac arrest," said Silvant Patel, chief conservator of forest, wildlife, North Bengal. Nilphamari, 18 February : Police today arrested a member of the outlawed Jama'atul Mujahideen Bangladesh (JMB), a militant organisation, from a village in Jaldhaka upazila.Jaldhaka police rounded up Mashiur Rahman,40, an assistant teacher of local Rahmania Madrassa in a raid on a house at Purba Khutamara Choupathia village in the morning. He was arrested on the basis of information provided by 13 JMB men arrested in Nilphamari, Rangpur and Lalmonirhat districts during last two months. A large number of 'Jihadi' books, leaflets and important letters were recovered from Mashiur's possession. The arrestee was being interrogated at Jaldhaka Police Station. Howrah, 18 February : Eight persons were arrested with 6kg of heroin in two raids by the Narcotics Control Bureau (NCB) and the detective department of the city police on Wednesday. 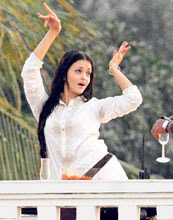 The haul is worth Rs 6 crore in the international market, sleuths said. NCB officials said they had information about the contraband being transported to Kolkata from Nasik. "We laid a trap at the Chichra checkpost on the West Midnapore-Orissa border and seized two trucks," said an NCB official. "We arrested the drivers and two helpers." The sleuths found 5kg of heroin hidden in boxes in the drivers' cabins. NCB officials also arrested another person in Bongaon, who was supposed to receive the consignment. The heroin was headed for Bangladesh, the sleuths said. The Kolkata police arrested three persons in front of Race Course Ground while they were heading towards Esplanade in an Ambassador with 1 kg of heroin. "One of the occupants of the car fled," said city detective chief Jawed Shamim. Mumbai, 18 February : Today International Cricket Council Chief Executive Haroon Lorgat said that, the opening ceremony of the 2011 cricket World Cup will take place in Bangladesh. The grand opening ceremony of the 2011 cricket World Cup will be held on 19 February, 2011.Lorgat also said that, ICC has also decided that the opening game will also take place in Bangladesh on the same day which is going to be a Saturday. He also said that the ICC had a preliminary discussion about the number of matches to be played over 15 venues. Lorgat said after the meeting of the 2011 World Cup Central Organizing Committee which met in New Delhi today. Bangladesh, India, Pakistan and Sri Lanka will jointly host the 2011 Cricket World Cup. Cox's Bazar beach ranks number one in 7 Wonders ! Dhaka, 18 February : The world's longest unbroken beach Cox's Bazar now ranks number one in the race for the New Seven Wonders of Nature. 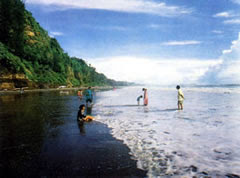 Cox's Bazar earlier ranked second in “Group G”, a category for seascapes of a total of seven categories under the New 7 Wonders Foundation. The Sundarbans ranks third in "Group E" for forests, natural parks and reserves. The results of the first phase of voting in the official New 7 Wonders of Nature campaign were announced 7 January at the New 7 Wonders Foundation headquarters and Cox's Bazar initially ranked third. Voting in the second phase to select the top 7 will continue until 7July, 2009. The overwhelming support of the citizens of the Bengal, including expatriates, helped Cox's Bazar and the Sundarbans to regain the top positions, Bangladesh Parjatan Corporation said in a statement today.